My journal about trying to live a modern Victorian lifestyle in the suburbs of Chicago. Whether it's gardening, antiques, food, decorating, cats, nature or travel, I always have my eye out for that Victorian feeling. There are so many styles encompassing the Victorian era, and many overlap. My favorite styles would have to be Eastlake and Aesthetic for furniture and interior decoration, and Queen Anne and Stick Style for exterior. Although Italianate is nice, too! I really just collect what I like, and when choosing furniture, woodwork and wallpaper, I gravitate toward Eastlake. I like the incised carvings, the dark woods, and the clean lines on the furniture and other household items. 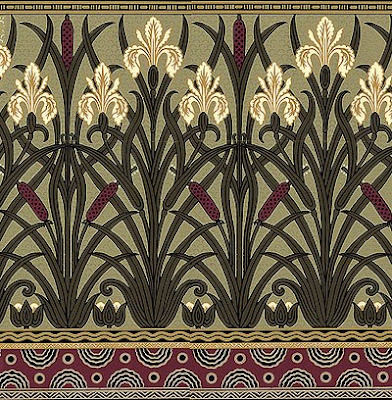 When it comes to wallpaper, I've found Bradbury & Bradbury papers most suit my taste. I love their Fenway Iris Frieze, which I really want to use as the dado in the room that will someday become our library. I want my walls to follow the tripartate system, breaking them visually into three distinct sections. This way, my walls will consist of (from top to bottom) a cove molding, a frieze, a picture rail, a fill wallpaper, a chair rail, a dado (either wallpaper, beadboard, or Lincrusta, depending on the room), and a baseboard with cap and quarter round. Unfortunately for me, wallpapering is the last thing on my long list of things to do when restoring my house. More than anything else, it will be what brings the rooms alive with that Victorian feel.